The Farnworth branch of Woolworths, prior to closure on the 06 January 2009. Photograph by Terry Wha (Creative Commons Attribution License). This year and the last haven’t been a good one for retailers. This week has already seen the demise of Clintons Cards. In the last six months, we have seen Game close branches, news of fewer new Wetherspoon pubs opening the North of England and Greggs reporting a drop in sales. The rise of internet shopping may well be making a tangible affect on the retail trade as online shopping offers more convenience and choice. Today, our streets are less diverse than they were 15 years ago. If you go back 25 to 30 years ago, they were even more diverse than in 1997. The chain stores had less than a national presence in 1982 compared with today’s high street. There was also regional chains with a clearly defined presence in certain parts of the United Kingdom. For the purpose of this post, East of the M60 will take you on a stroll towards The Lost Precinct. The dark brown Austin Allegro is waiting outside your deck access Bison built flat. A North West England and North Wales chain of electrical shops. Often associated with sister company Edwin P. Lees, their cut price adverts would often be set in one of their showrooms. In the early 1980s, the budget didn’t even stretch to live action. Viewers in Granadaland would often be treated to a static screen with the dulcet tones of Jim Pope or anyone else able to do voiceover in Quay Street for their 15 seconds of fame. Lovers of sweat and static advertised by Alan ‘Fluff’ Freeman offered most 1970s families cheap bed linen made from all your favourite synthetic materials (well, nylon and polyester). Manchester’s branch was situated in Piccadilly Plaza where the city’s Tourist Information Centre is now based. Following a rebranding as Brentfords in the 1980s, the chain disappeared for good in 1995. Founded in 1945, Great Universal Stores acquired a chain of furniture stores known as Cavendish or Woodhouse, then in consolidated form as Cavendish Woodhouse, with 350 stores by 1983. Some of the stores became branches of Times Furnishing. There was a branch in Oldham on Mumps Bridge, a short walk from the bus station and Yelloway’s coach station. Launched in 1979, WHSmith’s do-it-yourself chain majored in being a formidable rival to B&Q and Focus. Expansion began with the acquisition of Fine Fare’s ‘Fix and Fit’ stores, as was the case with Hyde’s branch. Voiced by David Jason, its adverts exuded economy and chirpiness, often featuring three men and a white van (a riposte to the Kwik-Fit ads without the tyres and blue overalls). Following acquisition by Boots, it was later sold by Boots in 1998 to Focus, with stores briefly known as Focus Do it All. Today, Focus are no more, following an ill-fated acquisition of Wickes (later sold to Travis Perkins). The German company was formed in 1986 by Manfred Schmitt as the computing arm of his music company. They expanded in the UK by means of acquiring the Calculus chain of computer stores and Rumbelows’ electrical stores. In 1995, they purchased Commodore International following the computer company’s bankruptcy the previous year. Rather than retail competition, it was rapid growth which led to its implosion and the end of retail sales in July 1996. Commodore International was sold to Tulip with the spun off Amiga Technologies transferring to Gateway. Oldham’s Escom branch was a former Calculus store situated in the Spindles Shopping Centre. Fine Fare expanded by means of cheap and cheerful town centre stores. With the company becoming a basket case, Garfield Weston took over as MD in the early 1970s, took it towards the hypermarket revolution and the rest was Bless Me Father. The one in Hyde was opened in 1976 by Derek Nimmo (of the aforementioned religious comedy fame) and boasted a café, petrol station and a newspaper vending machine (for the sole purpose of the Manchester Evening News). Expansion of the chain continued with some diversification towards DIY (the Fix and Fit stores, later sold to the then WHSmith owned Do It All in 1986). As part of the Dee Corporation, the Fine Fare name was discontinued in 1988, with all stores becoming Gateway supermarkets. Founded by Gerald Weisfeld in Glasgow (1971), the store chain crossed the southern half of Hadrian’s Wall following a takeover in 1990. Its stores, more than anything, were a downmarket alternative to Kendal Milne and Co., with a mix of bargain basement clothes and footwear. Oldham’s branch opened in 1993, taking over the former C&A unit (that chain’s branch becoming one of Spindles’ anchor stores), with Manchester’s being based on Oldham Street. Under new ownership, ‘what’ was spelt correctly, and maintained market share being owned by Poundstretcher’s parent company Brown and Jackson. By 2002, What Everyone Wants was sold to Tradegro, with the chain liquidated a month later. Manchester’s branch forms part of the Northern Quarter, subdivided into multiple units, with the Oldham branch now incorporating Home Bargains. Founded in Cleckheaton in 1885, the family business had a substantial base around the West Riding of Yorkshire. They were known as Lion Stores from 1900 and opened warehouse style stores in Wakefield, Leeds and Lincoln. Another first for them was the introduction of free buses; some early customers had their bus and tram fare paid for on visiting one of their shops. They adopted the family name Hillards in 1972 following a share issue and saw continued expansion towards Derbyshire, Lancashire and Nottinghamshire. A hostile takeover battle saw the chain sold to TESCO in May 1987. By then, new stores had opened in Glossop and Oldham. Today, there is a lasting legacy of their 102 years of retailing by means of The Gay and Peter Hartley’s Hillards Charitable Trust, which offers donations for community projects for charitable bodies. Littlewoods’ rival to Argos. Whereas only Argos succeeded with the catalogue discount shop format (thanks also to a few well positioned former Green Shield Stamps Redemption Points), Woolworths and Littlewoods had a stab at that format. Littlewoods’ Index already had brand recognition from the mail order catalogue sector and opened, in the late 1980s their own answer to Argos. Some such as the one in Rochdale were relocated inside Littlewoods stores. Others were standalone units, such as the one in Spindles Shopping Centre, Oldham (close to the western entrance of Town Square Shopping Centre). A rival tailoring chain to Montague Burton. Founded as the Fifty Shilling Tailors, it offered cost conscious gentlemen a tailored suit at a competitive price. They were taken over by United Drapery Stores in 1958 and assumed the guise as one of Britain’s foremost retailers in that field. By 1983, Hanson plc purchased UDS and dropped John Collier like a hot potato to its management, who later sold John Collier on to their one time rivals, Burton. Ashton-under-Lyne’s store was located on the corner of Warrington Street and Stamford Street, closing in 1986. Another staple of many a Christmas Day furniture advert festooned ad break. KoL entered liquidation and was sold to Natuzzi. ‘Fill a trolley full of value at Lo-Cost‘ trilled the Giorgio Moroder style soundtracked adverts of Argyll Foods’ discount chain. Lo-Cost was one of two discount chains operated by Allied Suppliers, prior to James Gulliver’s acquisition in 1982. A 1985 consolidation of Argyll Foods’ business saw the absorption of familiar names like Galbraiths, Templetons and Hintons into the Presto brand. Some of the smaller stores closed with bigger ones becoming Prestos. Elsewhere, Liptons stores would either become Presto stores or Lo-Cost stores, with the latter being true of Stalybridge’s branch on Grosvenor Square. Today, the Stalybridge branch is now a Superdrug which, in 2015, became a branch of Savers. Rose to prominence in the late 1970s, Mainstop’s supermarkets had a solid base in Northern England with market style fresh food counters and a record section. There was also cafés in the form of Bumpers Burger Bar, a knock-off Wimpy bar in laypersons’ terms. Such features caught the eye of Wm. Morrison plc who acquired the chain in 1981. These included branches in Gainsborough, Southport, and Darlington. They were originally part of British American Tobacco whom at the time owned Argos and International Stores. Their big box International Supermarkets branches became Mainstop shops. The Mainstop logo was a multicoloured weaved hashtag rotated 45˚. The short lived chain also had a bespoke typeface. Both were designed by Terrance Conran of Habitat fame. If you’re under 20 years of age, there’s every chance that you may be unable to remember when electricity boards – and gas boards – used to have their own showrooms. This stems from an era when domestic gas or electrical appliances were new and exciting. Therefore, the local electrical boards and companies would show off their wares in sumptuous showrooms, and enable customers to pay their bills. On nationalisation, our area’s electricity was supplied by the North Western Electricity Board – or NORWEB for short. They continued to have showrooms in prime positions up to 1996 (four years after privatisation), when their showrooms were sold to Scottish Power, who opted for out of town locations. Prior to 1998, NORWEB would have smaller units, in use as cash offices before Direct Debit and Post Office payments took over. NORWEB’s original showroom in Ashton-under-Lyne occupied part of the present food section of its indoor market, before moving to a unit in Metrolands’ then new shopping precinct [today’s Ladysmith Shopping Centre]. Stalybridge’s was a modern showroom on three floors next door to a branch of the Trustee’s Savings Bank (now Lloyds TSB), after moving from Thorn House, Waterloo Road. The ground floor is occupied by Quality Save. A one time rival to Virgin and HMV. Our Price grew in the 1980s by having a slightly more specialist range of records compared with mainstream retailers such as Boots and Woolworths. It was second to the latter stores in sales of popular music. 1986 saw the company acquired by WHSmith, and consolidation of their Sound FX music shops into the Our Price banner. However, it was a resurgent HMV which saw to that. Acquisition by Virgin saw the name eroded with ‘V Shop’ adopted for former Our Price stores. Then Virgin left the scene, became Zavvi and entered administration, swallowed up by… HMV, whom in recent times have had their fair share of problems. The name ‘Our Price’ was sold to Entertainment Direct. Instead of shops, the name is used for a charitable division, offering signed records and film stills for charity auctions. One of the main chains of the Argyll Foods conglomerate. Launched in 1977 as part of Allied Suppliers, it already had great brand recognition in the North East of England and Scotland with the name derived from ‘Prestonpans’ prior to James Gulliver’s acquisition. In 1987, Argyll Foods acquired the UK arm of Safeway Stores from its American parent with some stores becoming Safeways between 1987 and 1988. The Presto name continued until 1996, fully integrated as Safeway, prior to Morrisons’ takeover in 2004. Ashton-under-Lyne’s Presto store opened in 1981, on the ground floor of Tameside MBC’s offices. Car parking on Camp Street was shared with the supermarket chain on opening. At the entrance on the open market side, there was a café. In 1988, it became a Safeway before closing in 1992. September 1992 saw the unit taken over by Wilkinson, with the café continuing till 1994. The furniture store chain formed in Norwich by Anthony Parish in 1967. Their stores, accompanied by aggressive TV advertising, popularised out-of-town shopping. Philip Harris took over from Parish, following the founder’s ill health and ran the business from 1977. Following another sale in 1988, the company filed for bankruptcy in 1992 subsequently taken over by Allied Carpets. Their Rochdale store later became a MFI before they followed Queensway into the great retail park in the sky. The retail arm of Rediffusion formed a small but significant part of its business. Rediffusion’s shops offered a range of televisions for sale or rental. In some areas, it was the company’s cable service which formed the bulk of its sales, though their chain expanded into non-cable areas. Their Rediffusion Cablevision service enabled subscribers to watch the main three channels, a community channel and listen to Radio One, by means of a wall mounted dimmer style switch. Ashton-under-Lyne’s branch was situated on Mercian Way on today’s Ladysmith Shopping Centre. Its shops were sold to Granada who kept the Rediffusion name for a year. The cheaper version of Fine Fare. In the early 1980s, some of the town centre Fine Fares became Shoppers’ Paradise stores, stocking most of the Fine Fare Yellow Label brand items. The one in Ashton-under-Lyne was formerly Coopers’ supermarket prior to becoming a Fine Fare. Then it became a Shoppers’ Paradise store until 1984. The end of that year saw it become Tameside’s first McDonalds, and a well patronised one at that 28 years on. Toy and Hobby was a required destination among Children of the 1980s like myself. Toy and Hobby’s stores were brightly coloured inside with green rubber flooring and predated the invasion of Toys R Us by being a rather buzzy place, with high shelves full of Sylvanian Families and Lego Technic sets. My nearest one was in Oldham overlooking the Town Square Bus Station, assuming that guise till TJ Hughes occupied its former unit. A feature of many a Northern street, United Cattle Products’ shops and restaurants offered its shoppers a nutritious and low calorie food derived from a cow’s stomach. Towards the 1950s, some of its restaurants had an exterior inspired by Art Deco architecture. The Manchester one on Market Street (opposite the Arndale Centre) was a modernist structure which became a Schuh store then latterly a temporary art gallery and was pretty striking in its day boasting four floors. East of the M60, there was also branches in Ashton-under-Lyne, Oldham and Hyde among UCP’s 146 shops. Tripe was bleached prior to sale in two bases, with the main one in Levenshulme. Their second base was Arnold and Hough’s in Ashton-under-Lyne. Today, this forms part of Grampian Foods’ processing plant, hitherto Dalehead Foods and Dixons. In the early 1980s, a Virgin Megastore would often be a dependable source for finding more far out records than the usual chart stuff. In the 1990s, they expanded, covering provincial areas, taking Our Price with them off WHSmith and went global. By 2007, they ceded control of its UK and Ireland stores, with a management buy out, under the name of Zavvi. The following year saw Zavvi’s demise, owing to problems with their distributor Entertainment UK (which was also a factor of Woolworths’ demise). Their smaller stores were closed with the former Virgin Megastores remaining open as branches of HMV. 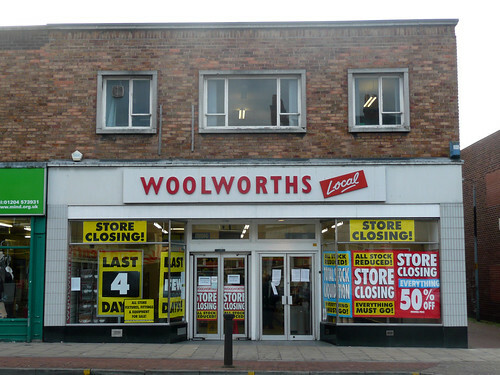 It is hard to imagine a shopping street without a Woolworths store these days, following the demise of its bricks and mortar business. In our area east of the M60 motorway, they had a sizeable presence with smaller branches in Shaw, Stalybridge (till 1974), Hyde and Glossop as well as in our major town centres. The main depot too was East of the M60 in Castleton, next door to the Dunlop factory off Sudden roundabout. F.W. Woolworth did fixed price retailing years before Poundland did. In the 1960s, it became synonymous with the Embassy Records label where soundalike musicians would sing the latest hits of the day. In the 1970s, the purchase of the Ladybird label saw it corner the market in children’s clothing. By the 1980s, bargain basement video films (for the price of a blank cassette) and pick ‘n’ mix consolidated its position. By 2008, its uniqueness was eroded by superstore chains doing what Woolworths did for years, though only better. Therefore, the convenience of free parking offered by its imitators saw to its demise – even though Woolworths did have a dalliance with out of town retailing through its Woolco stores and The Big W. Today, Woolworths only exists as an online retailer. Ashton-under-Lyne’s branch in The Arcades (opened October 1994) remains partially empty with only the ground floor occupied by Poundland. B&M Bargains has the Rochdale store, with Poundstretcher taking over Hyde’s branch. Oldham’s is now Sports Direct. A bargain basement store chain in the Mark One/What Everyone Wants mould. Manchester’s branch was seen in the northern section of the Arndale Centre prior to refurbishment. It subsequently became a Poundland after lasting barely more than a year. Previous occupants included Parker and Franks, another discounter. A small regional chain based around Greater Manchester, selling discounted crockery. Most items were either overstocks or slight seconds. The Ashton-under-Lyne store was on Mercian Way, opposite Timpsons’ key cutting shop. A rival to Toy and Hobby which expanded through acquisition. Owned by the Maynards group (of their wine gums and loose moose ad fame), most of its units were located in new purpose built shopping centres with the same High Shelves and Pester Power friendly layout. East of the M60 motorway, there were branches in Rochdale and Stockport. Manchester’s was situated in the Arndale Centre. The Zodiac Toys business collapsed in 1990. Spent up? Able to delve deeper into our lost precinct? If you have any recollections of working for any of the 26 retailers, or shopping in any of them, feel free to comment away. As usual, feel free to add some more to our list. Some good shouts there. Radio Rentals was swallowed by the Box Clever chain which was Granada’s rebranded retail arm. They now only trade online. DER was also part of the Thorn EMI conglomerate from 1968 along with the aforementioned sister company whilst continuing as a separate concern. They too were merged with Radio Rentals prior to the boxclever [sic] juggernaut. Visionhire too suffered a similar fate. Rumbelows’ stores were taken over by ESCOM (whom most computer users would associate with their disastrous short lived ownership of Commodore), before they too left our high streets in 1997. John Menzies no longer has shops today, though continue to trade as a magazine distributors and are still a FTSE listed company (last share price: 569p). I don’t remember the Remington shop in the Manchester Arndale centre, though another came to my mind. There was Jigsaw World, a smallish unit which sold nothing but jigsaws and associated products. The Apple Store is more or less on the same site as to where Jigsaw World was; back when MVC used to be where Next is today. I like this page and others. My one suggestion which may well be obvious would be a need for some photographs of these stores which would help jog the memory far more I think. I find your second introductory paragraph a bit odd. I think it needs a slight rewrite to make sense. I think doing the same but focussed on each Town centre in Tameside would be a good idea, or at least the main ones eg Ashton and Stalybridge; particularly Stalybridge given the current state of affairs and the attempt by TMBC to obtain ‘Portas’ funding for it’s regeneration. Would be nice if they allowed plebs to attend ‘their’ new Stalybridge Town group to add ideas/thoughts, especially given the amount of money already misspent by TMBC in its continued degeneration (not regeneration as they say) of Town centres and much else! But alas I find I’ve been excluded. I did attend TMBC’s Empty Property Consultation event on the 14th February 2012 but there appears to have been no follow-up. I also think I kinda accidentally ‘gate-crashed’ this meeting in that I don’t think I was supposed to be there! My recent repeat email to my MP, and others, has been ignored, and this despite contacting my MP Jonathan Reynolds as per a recent article in the Tameside Advertiser where he asked people to contact him about Stalybridge! Andrew Gwynne MP (not my MP and not his area) has responded, as he so often does to my emails, but not the ignorant Jonathan Reynolds MP! I don’t feel it’s all down to market forces either! I’ve seen the decline in Stalybridge over the years and watched how many stores died as a result of so-called regeneration! In this regard Mossley has been lucky! The ‘out of town’ developments have, of course, a lot to answer for. The main demise in Ashton began with the birth of the Snipe Retail Park. I remember how various stores like Comet cleared off from Stamford Street to the Snipe. And then we have the more recent Ashton Moss development and the latest consequence with M&S stating that they will be moving there too, though not that far really being on the fringe and thus close to Ashton Town Centre. Perhaps also positioning themselves for the Metro’s arrival too! I did wonder whether they were moving because of the demise of Ashton Town centre, or because they had advance warning that TMBC were yet again planning to alter Ashton Market to create a glitzy plaza around Ashton Town Hall steps. They’ve already obtained funding for their current devastation of Hyde Town centre for the formation of a glitzy plaza and the unnecessary death of several trees. A very un-green council despite their rhetoric to the contrary. It’s difficult to reconcile the many tree ‘whips’ planted along the new Northern Bypass and Crickets Lane with the felling of the massive mature white poplar at the junction with Penny Meadow! About 11 whips have also been planted in the nearby memorial park. Tameside has no Tree Strategy and this Council no real idea of tree coverage in Tameside either. They and New Charter continue to devastate trees and yet continue to say they are also planting trees! But without a full and proper inventory and an overarching Tree Strategy this cannot be assessed which suits this council just fine. I have obtained copy of a Tameside Tree Strategy document that never happened! Still, how many whips and how big will they grow, especially when they are mainly Birch trees which will not grow very large at all. These whips obviously have a small carbon footprint value compared to large mature trees like the one they felled. And how many years will pass before their carbon footprint equals that which they’ve destroyed, if ever! New trees have often been planted and destroyed by this Council. I well remember as a kid the numerous pink and white blossom trees that lined the streets of Ashton centre particularly Stamford Street at the St Michael’s end. And now look at it! Fortunately a few mature trees have survived here and there. But I mustn’t go off too much at a tangent here about trees even though they do form the major green infrastructure alongside the grey building infrastructure. Thank you for your (most lengthy and) erudite comments. It is funny that you should suggest a Lost Precinct for the Tameside area. I have floated the idea as a possible spin-off from this more general post, possibly on a street-by-street basis. Regarding the fall from grace of Stamford Street and other multiple stores in Ashton-under-Lyne, Snipe Retail Park and Ashton Moss aren’t wholly to blame. Closer to home, Crown Point North in Denton is always busy (it also has some stores which Ashton cavorts yet lacks). Their car parks tend to be fuller than the Snipe Retail Park. Secondly, there is also the lure of Manchester city centre, made more attractive by frequent – and modern – 216 and 219 services, and the unbeatable 10 minute journey time by rail! I’ve always found what I’ve wanted in ‘Town’ more than in my immediate locality. aww..my dad worked for John Collier in Blackpool in the early 70’s when I was a little girl.. I remember the John Collier stores in Ashton-under-Lyne and Oldham. The latter, if my memory serves me right, became a Fosters store. Thank you for the link. I came across it a few months ago when I was trying to research the short history of Mainstop – ironically for this post! P.S. I have misspelled ‘Mainstop’ as ‘Mainspot’ in the article. When was Farnworth Woolworths built? I only have a rough idea going off the architectural style. It seems to be of late 1950s origin and one of a standard style of small F.W. Woolworth stores designed by Harold Winbourne. After the Second World War, Mr Winbourne, their in-house architect worked on part of a rebuilding programme to make its stores attractive to late 1950s and early 1960s shoppers. Some were rebuilt elsewhere or on the same site of an existent branch. Others, particularly in historic town centres were dealt with in a way sympathetic to its character. For a comprehensive account of F.W. Woolworth’s history, I fully recommend ‘The Woolworths Museum website (www.woolworthsmuseum.co.uk). You can even download a list of stores from 1973, 1986 and 2009 and listen to any records on the Embassy and Chevron labels. Granada TV Rentals would consume Visionhire and Radio Rentals to form Box Clever, before they too disappeared from our High Street. Decorate was actually known as Decor 8 – several years before text messaging speak became popular. I grew up in the East Midlands (Nottingham) rather than the North West, so regional differences may be more than apparent here! Still, a great read when I came across it on Google. I remember Cavendish Woodhouse as my family had their mahogany wall unit with shelves, cupboards and everything, including a light for a cabinet display from there in about 1983, rivalling the cut-throat teak and mahogany of the sub-Schreiber and G-Plan monopoly left over from the 1970s. Only got rid of the wall unit a couple of years ago to make way for Ikea flat-packed shelving! CW closed down in early 1989 I think, and the building it was situated in had shops that lasted a few weeks and it’s been mostly closed since then. My late mother was an agent for the John England catalogue in the 1970s and 1980s, and I knew that there was a link between them both courtesy of GUS. Zodiac Toys, I remember as well. Also on the subject of toy shops, Toymaster, Children’s World (owned by Boots) and Jolly Giant – toy superstores always found in out of town retail parks. Only Toys R Us seem to survive now. TV Rental shops – Rediffusion as you mention – same name and logo as the 1950s and 1960s London ITV company, ironically took over by north west ITV company namesake Granada. The days when it was too expensive to buy televisions and videos so one had to rent them. Radio Rentals (I am sure Kenny Everett did the v/o for the adverts – “you’ll be glued to our sets, not stuck with them”). Rumbelows of course, especially with the sub-Mr Men characters in the early 1980s adverts. Not to mention, Wigfalls, Telefusion (had a hand in winning the Yorkshire TV franchise in 1968), Multi-Broadcast and others as well. I assume that as the price of televisions and videos went down in the 1990s people could afford them more and so there was no need for rental shops. What about Matthews Butchers? I used to think that they were connected to Bernard Matthews when I was younger considering both their names and the connections they had with the meat industry. (In the same way that I assumed that Anglian Windows and Anglia TV were connected because of their identical names and they both had a silver horse logo as well). I remember on our local news in the mid 1980s someone who had left school at the age of 15 to work for Matthews who employed him illegally. When asked whether he would go back to school to do his GCEs, he replied “never”. Cordon Bleu freezer centres did the rounds in the early 1980s, along with Wallis frozen foods. I am sure that Farmfoods or Iceland took them over like the latter did with Bejam. I remember that Index shops were called The Catalogue Shop until 1988. They opened in Nottingham in 1987 and local man Leslie Crowther came to open it. He autographed the back of the customer selection form inside the book! And every time I saw a copy of that catalogue, I often looked to see whether it was signed, and it wasn’t of course. We also had Littlewoods until it closed in 2005 (same year as Index), but that had an Iceland inside that, making me assume that Iceland was part of Littlewoods. On the afternoon of 11th September 2001 I was in Index and brought myself one of those director’s chairs. I went home, turned on the television, and what I saw was history. John Menzies – identical to WH Smith apart from the fact that Menzies sold sweets (although Smiths do that now of course). Not pronounced “Ming” or “Mingis” as a Lib Dem politician calls himself. Furniture superstores – ELS, Wades, and also Maple, Waring and Gillow. Always advertising their Boxing Day sales on Christmas Day. Wonder if a store called Confetti was national? They were around circa 1988 and sold sweets and pick n mixes. Anyway, I have gone on a bit, so I hope this is some use to you. Don’t worry too much about going on a bit. In fact. I welcome lengthy and lucid comments which add to the life of each blog post. As to whether it is any use to me, a wholehearted ‘yes’. Toymaster is still alive and well today. It remains a consortium for independently owned toy shops, in the same way Euronics does for independent white goods retailers. The Children’s Worlds were sold to Mothercare which, for a short time, were Mothercare Worlds. Other than Toys R Us, you’re looking at Smyths toy shops and The Entertainer. I too – vaguely – remember the Mr Men influenced Rumblelows adverts, but I can also recall that the late Roy Kinnear did voiceover for Radio Rentals. Ironically a few years since his lead role in The Squirrels. You are right in stating that the reduced price of televisions have consigned the likes of DER, Multibroadcast and Visionhire to history. Not just technologically but also the aggressive buying power of superstore chains. I don’t remember the Matthews chain of butchers but I understand your connection with Bernard Matthews and Matthews, though neither were connected. Cordon Bleu freezer centres were part of Argyll Foods who also owned Presto, and they disappeared around 1985-86. Well remembered on the Index shops being known as ‘The Catalogue Shop’, but I forgot about the fact WHSmith and Son didn’t sell sweets at one time! I too remember some Iceland stores being food concessions in Littlewoods stores. Their Oldham branch had an Iceland concession whereas Rochdale’s had an Index on the first floor. I never went in a Laskys store but I cannot forget their TISWAS style logotype (pretty decent it was too). Though I never went in neither store, I too remember ELS and Wades, and – as you said – their advertisements, often one on Christmas Day, Bank Holidays and Boxing Day. Likewise with Tommy Vance trying to sell Hygena units for MFI. There also seemed to have been more regional variations among chains throughout the 1980s compared with 2014. That is one thing I miss about today’s High Streets. At one point, you could tell if you were in Cheshire if you saw a branch of Silcocks’ greengrocers. Or a Merrie England café if in West Yorkshire. Likewise with Burneys bakery in Lancashire and Preedys in Staffordshire. Excellent comments and anecdotes there. P.S. In 2004, I went to a subterranean café in Nottingham city centre. Being pre-smoking ban era, it was akin to sitting in an ashtray yet popular. At the time, it seemed to have gone into independent hands after being – what I thought – was like a Country Larder café. I would be most grateful if you could clarify this for me. What a blast from the past some of these titles are. I loved Zodiac and Toy n Hobby. A truly exceptional blog that has stimulated my 80s memory sinews. Here’s one….. Do you remember Weigh & Save, and, Jaymax? These were situated in Stretford Precinct, or as we colloquially like to say “Stretty Prekky”. Also, there were two book shops in St Annes Sq in Mcr called Dillons (which became Waterstones, then, subsequently a bank) and Sherratt & Hughes. Thanks for the compliments. Couldn’t speak for Zodiac from personal experience, but Toy and Hobby, most definitely (having mentioned the Oldham branch; the Stockport one was pretty decent too). I don’t remember Jaymax but I do remember Weigh and Save. The branch I frequented most was on Old Street, Ashton-under-Lyne next to Spencers’ Bookshop. Stalybridge’s branch was on Grosvenor Street nearest to another branch of Spencers’ Bookshop in a building hitherto owned by the Co-op. I remember Sherratt and Hughes’ store when it was a WHSmith, and I do remember Dillons. There was a third bookshop which I miss most: adjacent to Barton Arcade was Sportspages, which sold nothing but sports publications. When I worked in Manchester I used to call in there for my copy of ‘Groundtastic’, an excellent fanzine on football stadia from the FA Premier League to the Finnair Manchester League Reserve Divisions. It is great to see at least one part of the company is still trading. I have passed their works several times on many a train out of Oxford Road and on the odd Wythenshawe bound bus out of Piccadilly. Yes, I have seen that article. It’s very good and thanks for sharing. I may talk to my film friends and see if it can be used as a filming location (It’s gold dust) ha ha. Yes, I remember when S&H became WH Smith. I purchased a copy of Led Zep BBC John Peel sessions when I was in my early teens from there! Thanks for compiling this! I particularly remember shopping in Gwat Everyone Wants in Manchester in the 90s. Even as a kid I thought it had an odd name. I also used to frequent Influence in the northern part of the arndale. It also sold discount fashion and I remember 2 rather awful paisley shirts I was very proud of at the time. I too at the time thought its was an odd name. It sounded like the place where Gnasher and Gnipper [gratuitous Dennis the Menace from The Beano reference] would go for dog chews. I would say the misspelling was contrived to include the initials of its founder Gerald Weisfeld. “Gwat Everyone Wants” might have been easier to register as a trademark compared with the correct spelling. Influence, if my memory serves me right, would have been close to McDonalds. If it is, could this have been the former Parker Franks store which latter became Xception and the city’s first branch of Poundland? I too had a ridiculous coloured shirt in the Madchester era at the age of 12. It was a long sleeved flowered one which entered my wardrobe in 1991. Though I didn’t wear it often, I liked it at the time. What about the various different names the Co-op has used, L is for Leo’s N is for Normid Superstores, P is for Pioneer and S is for Shopping Giant (later Discount Giant). A good shout, and one worthy of a Lost Precinct spin-off feature. Right now, I can also think of Krazy Kuts (their answer to Kwik Save – branches in Uppermill, Littleborough and parts of the East Midlands), Scotmid, Homemaker, Metro (their electrical offshoot), Pricefighter and The Village Store. If you were fortunate enough to visit the Ashton-under-Lyne Cooperative Society’s flagship store, you went to Arcadia on Stamford Street. When I was six, I wondered why a Duran Duran side project wanted to adopt the name of an Ashton store (perhaps it had a better ring to it than David and Chohan). Mention of Greggs’ sales dropping at the start of this article seems to have reversed in the recent year with the addition of coffee, that some say is better than the major chains that clutter up the high street. I suppose this provides hope for struggling retailers as to how their fortunes can be reversed by a simple change. It amazes me how the smallest of changes could have great impact in retail. My experience of Greggs’ coffee has always been a cheapo tongue-burning plastic cup of Nescafé of indifferent quality. I’ve yet to try a 2015 Greggs coffee so my experience is partly tempered by previous occasions. The one in Ashton you may well know has a little seating area for eating or drinking indoors. That has always been a busy branch and the seating area is well monopolised. Returning to the subject in some way, Simply Eat in Ladysmith Shopping Centre, Ashton used to do a serviceable coffee for a pound. That is now a nail bar. The best bargain basement filter coffee I have found is in any of J.D. Wetherspoon’s pubs. That’s on the very odd occasions I shy away from the cask conditioned ales. H is for Hagenbachs the bakers with its Lite Bite cafes and take away sandwich bars in other areas they were called Carricks the bakers and also Whittikers the bakers i think they were taken over by Bakers Oven. Also T is for Timothy Whites they used to be chemists that were taken over by Boots. F is for Foster Menswear they used to be frumpy old fashioned mens clothes shops but were then modernised in the early 90s to cater for younger men. M is for Maynards the tobbaconist and sweet shop. S was for Saxone the shoe shop i think it was part of Freeman Hardy Willis and a couple of others Trueforn Mansfields and maybe even Dolcis. C was for Chelsea Girl and Concept Man again a modern trendy shop taken over by river island. F = First Choice a cheap ladies tops and knicker store. I think they were green with orange writing. I of course for internationelle again cheap clothes often with an Au naturelle inside. S = Spoils kitchen reject shops the one in the arndale was on the bridge when the bomb went off. L=Lewis department stores nothing todo with john lewis they had big department stores in Leeds Manchester ( now primark ) and Blackpool maybe more. There ws also a cheap menswear shop with shops simply everywhere that were yellow and had yellow carrier bags but cannot remember the name and finally a discount clothes shop i guess must have been part of arcardia group because they sold seconds of all their brand clothes in bags with a flower on them and possibly a number in the name. Great post, brought back many memories of Oldham town centre in the 80s and 90s. I too loved Toy&Hobby there, apart from the green rubber flooring the memory I have of it is shelves of Scalextric sets going up as far as the eye could see! I wasn’t allowed in there most times I was being dragged around Oldham centre by my mum, apart from the run up to Christmas. Can you remember what the computer games shop on Yorkshire Street in the 80s & 90s was called? I am struggling to remember it’s name. I used to go in there to buy Spectrum game cassettes and drool over the unimaginably expensive Commodore Amigas they had set up in there. I think they managed to survive till about the mid-to-late 90s I think. They never quite managed to make the shift in to the console era I thought, or maybe it was more the likes of Future Zone and other big chains opening up in the Spindles shopping centre.